Some of my favorite childhood memories center around imaginative play. As a child I remember asking my parents for a printing calculator one Christmas. No I wasn’t asking because I was a brainiac and wanted to improve my mathematical skills. I thought it would be the perfect addition to my grocery store! As kids we were constantly getting out all the items from our pantry and setting up a grocery store for my mom to shop in. I’m sure she loved “shopping” at our store 20 times a day! HA. Now that our kids are entering preschool it’s the perfect age to start thinking about imaginative play. But what if I don’t love it as much as I did as a child? 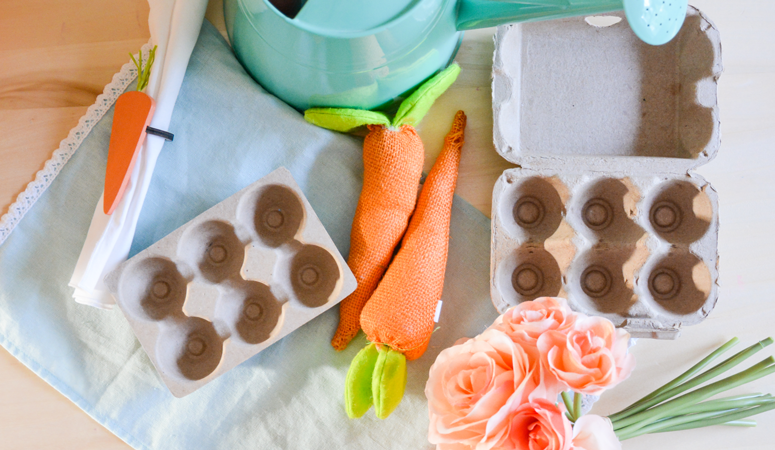 How can I make pretend play more fun as a mom? 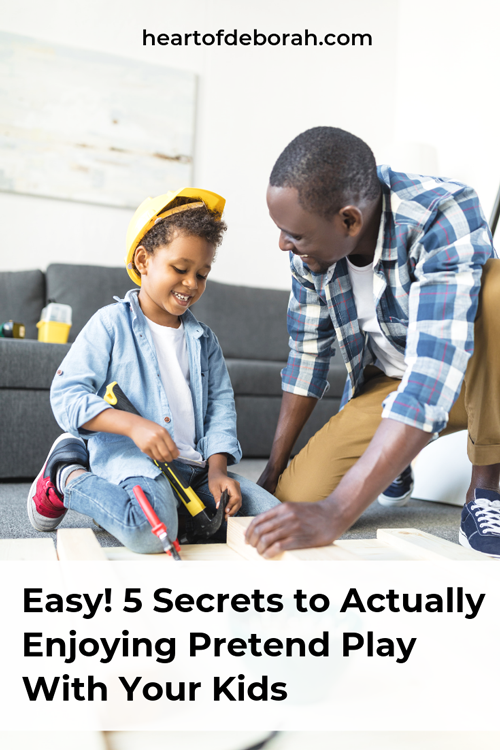 It’s not as easy for parents to engage in pretend play for hours on end as it is for preschoolers. This doesn’t make you weird. It makes your normal! I’ve heard people say “I’m not good at imaginative play” or “where do I even start?” If this is you, keep reading! 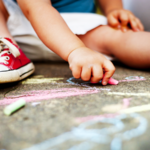 5 Tips for Engaging in Imaginative Play With Your Kids! First, take some advice from Frozen and Let It Go! As adults we are sometimes stuck in our ways or too sophisticated to think like a child. What would happen if we stopped worrying about how silly it sounds to ask for extra cream in my invisible coffee? There is freedom and joy in seeing things through our toddlers eyes! We all need breaks from social media and our phones, so put it down for a few minutes. Commit to spending 15-30 minutes in the play scenario without distractions. Then take a break if you need to. Remember the more you talk out loud about your play and step feeling so self-conscious the easier it becomes! As parents we may have to guide our kids into pretend play at first. When we first set up our coffee shop I needed to model to our children how to take an order, how to “make” the coffee and how to check someone out. Then I let them do their thing. When you show children how to work the basics of the play scenario one to two times it gives them confidence and an example to go off of. Of course, older children may not need as much modeling as younger toddlers. 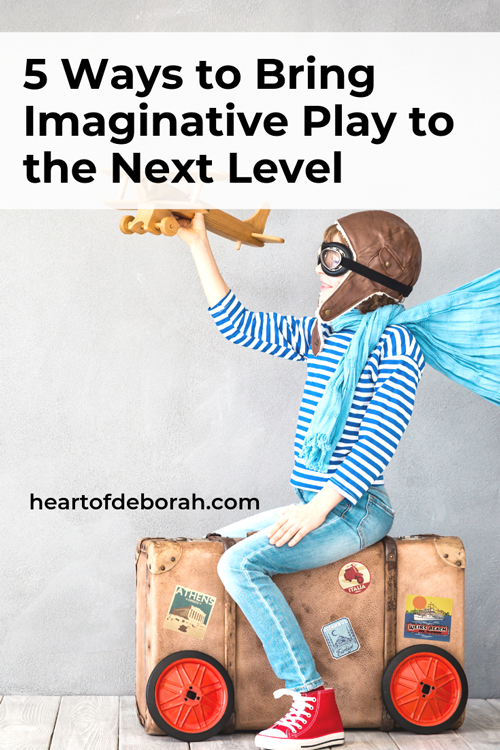 When you teach your kids to love imaginative play, it makes it easier on you! You don’t have to be a part of every scenario, but you can get them started and then watch their imagination take off. Third, don’t beat yourself up if pretend play just isn’t your thing. As parents we aren’t going to be perfect at everything, that’s just an unrealistic expectation. If you don’t love to play “store” then find something you do enjoy with your kids. It could be playing outside, crafting or reading a book together. Don’t punish yourself if this doesn’t come naturally. It’s totally normal to feel that way! Do the best you can. Fourth, it’s all about the toy selection! Look for toys or products that encourage this type of play. Kids loves to mimic what they see adults doing, so any toy that mimics adult tasks are perfect. 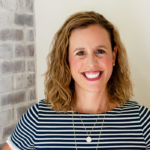 Examples include play kitchens, dress up clothing, play vacuums, shopping carts, cash registers, etc. Also remember it doesn’t have to be a pretend play toy that you buy at the store. My kids are often perfectly happy playing with a cardboard box and using their imagination to create it into a rocket ship or sailboat. Lastly, be picky when choosing toys. If you want to encourage pretend play, avoid toys that require batteries or electronics in general. When kids don’t have a voice telling them what to do they are forced to use their imaginations. They have to make the noise instead of relying on the toy to do it for them. You can also find thousands of pretend play printables on Pinterest. Check out our free dramatic play center printables: Coffee shop // Flower shop // Obstacle Course // Farmer’s Market // Food Truck. 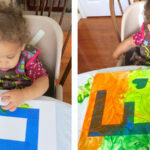 This will help you get creative without exhausting yourself creating different play scenarios. So I’d love to hear from you. Is pretend play torture for you? How do you encourage it in your children even if it isn’t your favorite thing? I’d love to hear your thoughts in the comments below. Also be sure to follow us on Pinterest for unique creative play ideas. Does pretend play come naturally to you as a parent?